As bustling crowds of children, parents and teachers pour out of the gates at a Beijing primary school, 60-year-old Zhang stands hardly visible. As a menwei, or doorkeeper, his duties are to open and close the gates, as well as check visitors' identification. Yet for the past three years, this small, timid-looking man has been the school's only security. He is badly paid and virtually untrained. Following a series of brutal attacks on children and teachers across China that have left 16 dead and dozens injured, Zhang is today flanked by two young uniformed guards as part of the city's efforts to better protect children against the threat of copycat attacks. Analysts say the move is only a short-term fix to a potentially long-term problem, however, and suggest that only by revamping an "unregulated" security industry "hampered by a lack of professionalism" will schools and other businesses be truly protected. Just a short walk from where Zhang works in the capital's Chaoyang district is a high school guarded by 22-year-old menwei Ma (neither of the guards wanted their full names to be used). Talking to Ma for only a few minutes highlighted some of the problems the industry faces. "I stand here all day doing nothing," he complained. "It's boring. It's a job that demands no technique, no skills therefore there's no development. "People all look down on the profession. Even I look down on the profession," said Ma, who like Zhang is a migrant worker from the countryside and received little education. After arriving in the capital from Hongtong in Shaanxi province, Ma said he plans to quit the job as soon as he finds a "more secure one". It is this attitude that is undermining the very nature of the security profession, say experts. "Security guards play an important role in crime prevention and control," said Zhang Hong, a professor with the public security department of the Chinese People's Public Security University. Although the police serve the general public, security companies can tailor their services to better suit the needs of a business or individual. "(Schools guards) should be able to understand the systems and the technologies well, implement solutions in emergency situations, intervene in conflicts among students and lead in safety drills. Their area of work should include far more than just the gates," he said. "School security is not just about countering attacks. Accidents can also happen, such as fires and traffic accidents on school outings," he added. Other experts also suggested guards could be further utilized to lead classes in safety, as well as teach student self-defense. The first security company in China was set up in Shenzhen, a large industrial city in South China's Guangdong province, in the 1980s. Based in the Shekou industry zone, it opened at the request of several foreign-funded firms. Until then, security staff were all dispatched by public security bureaus. Today, there are more than 3 million security guards working for about 2,800 security companies across the country, according to Zhang Hong (others estimate the number is closer to 5 million). Two decades on, however, most security guards are still "90 percent rural migrants with low education or retired soldiers" who receive far from adequate training, said Luo Ying, deputy general manager of China City Guard Security. Zhang, the primary school menwei, said he was given one month of training before he started in the job, "but it taught me virtually nothing". Ma, meanwhile, was given just two lectures - one on how to conduct a safety inspection and one on how to behave at his post - and some leaflets to read. "There's not much to learn, though," said the young guard. New regulations announced by the central government last year set stricter rules for security firms and introduced regular checks by public security bureaus. But although the rules require guards to have the necessary qualifications before being put on duty, "most still don't have them", said Ma. The poor wages offered to security guards has also prevented the sector from attracting the right candidates, said professor Zhang Hong. "Most security guards don't work for a long time because of the low pay and the lack of respect," said Ma, whose monthly salary rose from 900 yuan ($130) to 1,200 yuan once he passed his one-month probation period. "Such low pay won't attract qualified people. Even people who are unqualified don't choose to stay in the job for long," said Zhang Hong. "People won't pay enough attention to security until something happens." High-profile bank robberies in China in 1995 and 1996 led to a major rethink in security at banks, he said, adding: "Maybe now is an opportunity for us to boost the standard of security at schools, as well as the quality of security guards in general." To achieve this, however, attitudes of the people who employ security guards must also change, as many still misunderstand what the role involves, said Luo. "Foreign companies have high standards and demands for security guards," said Luo, whose company is based in Shanghai and has offices in several other major cities. "We have a few schools as clients but when we offer them services other than just gate duty, they usually refuse. "One school even included selling tickets at its gymnasium as part of a security guard's job description," he added. Despite its shortfalls, Luo, who founded his company in 1995, said he believes the security industry is still a growing market that will develop as demand steadily increases. 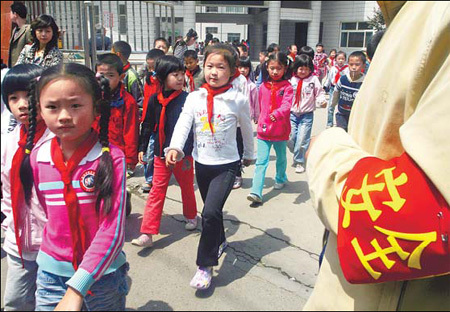 Since March 23, when Zheng Minsheng, a former community doctor, stabbed eight children to death in front of a primary school in Nanping, Fujian province, the nation has witnessed seven similar attacks on schools and kindergartens. In the most recent case, which occurred last Wednesday, a gang of youths armed with knives broke into a vocational college in the island province of Hainan and severely injured 13 students. National leaders reacted quickly after the initial attacks by calling for tightened security at schools, making it a "paramount priority", while provincial authorities have adopted various measures, from sending police officers to patrol schools in the mornings and afternoons to offering schools subsidies to hire extra guards. 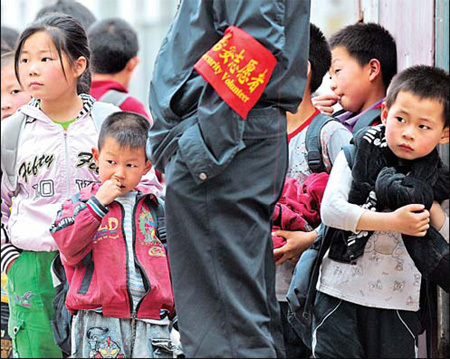 In Beijing, police can be seen outside more than 3,000 kindergartens, primary and high schools, which have also been equipped with emergency response gear, such as anti-stab gloves and vests, pepper sprays, and hooks and nets. 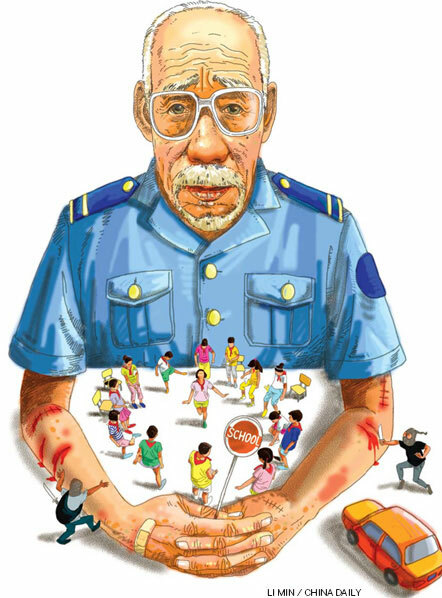 Luo said he knows of a medium-sized police station in Beijing that has assigned about 30 of its 70 officers to patrol kindergartens in the district, although China Daily received no response when it contacted the city's public security bureau to get further details. In addition, more than 500 schools have already signed contracts with security firms for trained personnel, with more expected to follow suit. "It's a scary world," said a mother surnamed Lu, 34, as she waited outside a Beijing primary school. "I don't work, so I walk with my 12-year-old son to school and pick him up every day. I ask him not to talk to strangers or to take sweets from them. I've also let him watch all the news about the attacks." Yet some analysts argue that the spate of attacks has nothing to do with the level of security at schools, and suggest that the high-visibility security measures, which have been covered extensively in the press, could increase fears of another attack rather than allay them. "These attacks are the result of growing unsolved social conflicts," said Guo Taisheng, director of the public security department at the Chinese People's Public Security University. "If a woman is killed, you can't expect a guard or a policeman to protect every other woman," said Yu Jianrong, a researcher with the Chinese Academy of Social Sciences' rural development institute. "Too much emphasis on security and the heavy police presence could make people feel even more insecure and lead to more problems in future. "It's time to boost our social welfare, care for poor people and find effective channels for people to file complaints," he said. 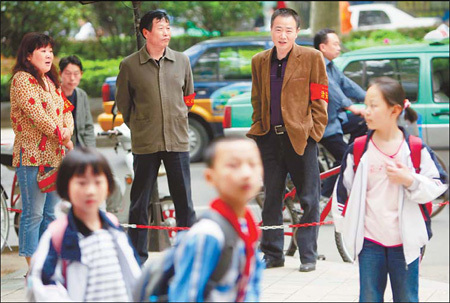 Liu Guiming, vice-secretary of the academy's juvenile delinquency study center agreed and added: "Seeing policemen guarding gates could actually leave people terrified." However, Luo argued that professional security guards are different and, if employed correctly, can offer protection without causing a sense of panic. "When we send our guards to schools, we try to choose those who are not too big or muscular-looking," said the expert. "We don't want the children to feel there is any difference in the security, thereby reducing the risk of making them insecure. "People don't often see police officers at schools, so they stand out. Security guards are everywhere in our society," he added.